Thinking about purchasing a subscription box for your cat? 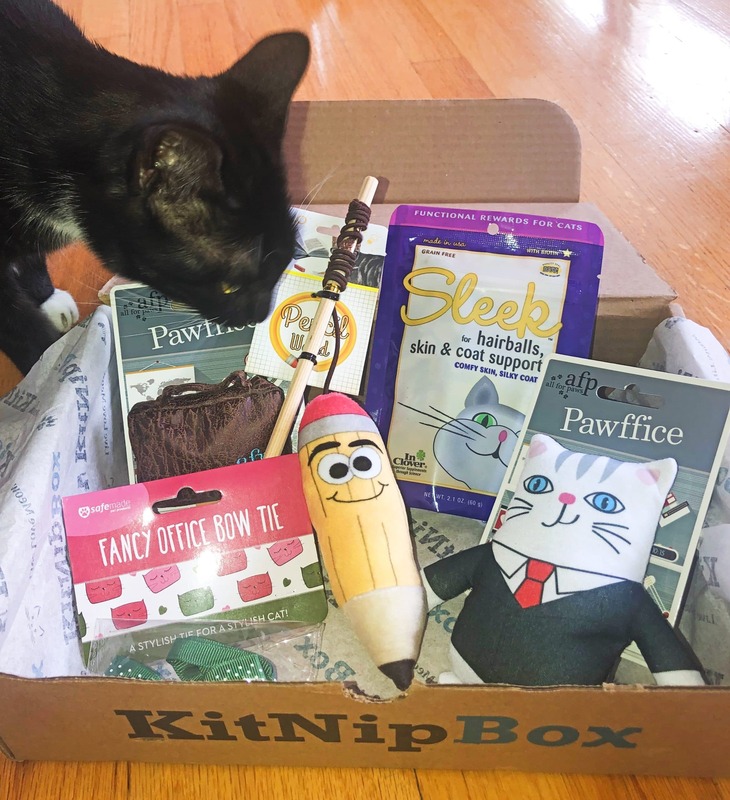 Take a look at our KitNipBox reviews to see products they offer, coupons, and similar subscription boxes. Plus, check out plenty more pet subscription boxes here! A subscription box for your cat is a great way to surprise them with new toys, treats, accessories, and other fun goodies every month! With KitNipBox, each box is exciting because it’s a surprise. Their boxes are fairly inexpensive and provide a variety of fun new items for your cat each month. After seeing the adorable reviews and previous boxes, I decided to try out KitNipBox for my one-year-old cat Benji. This is the first of my KitNipBox reviews! Today, I’ll talk about their subscription box plans, coupons for your first box, my first unboxing, and similar cat boxes that you might enjoy as well! Plus, I’ll keep you updated with monthly reviews for as long as I subscribe. There will be updated coupons in each of these posts, so make sure to check them out. KitNipBox offers budget-friendly boxes for one cat (called the Happy Cat box), as well as multi-cat boxes. Luckily, you can view the plans and pricing options before creating a KitNipBox login. Inside each box, you’ll find healthy cat treats, high-quality toys, accessories, grooming items, and other fun products. The single cat box provides five items each month and the multi-cat box provides seven items. Their website even shows a variety of images from previous KitNipBox months! Plus, in case your cat has a sensitive tummy, you can customize the box to remove any treats or food items. How Much Does KitNipBox Cost? As you’d imagine, the cost of your monthly box depends on which box size you choose. Single cat boxes are $19.99, and multi-cat boxes are $29.99. Shipping is free in the United States. They also offer shipping to Canada for an extra $6.95 per box and Australia for $7.95 per box. One negative thing I found is that their gift subscriptions are a little unclear. This page lists the gift KitNipBox price as $29.99 for a month, but it isn’t clear if this is for the regular box or the multi-cat box. If it’s the multi-cat, it’s a good deal because you can save money with longer gift subscriptions. The three-month term is $24.99 per box, the six-month term is $21.99 per box, and annual gifts are $19.99 per box. KitNipBox is already pretty inexpensive, so I was surprised and pleased to find coupons for additional savings. You can try out the subscription for an even better price! Their deals and coupons tend to change, which is why I’ll be sharing some in every month’s unboxing review. 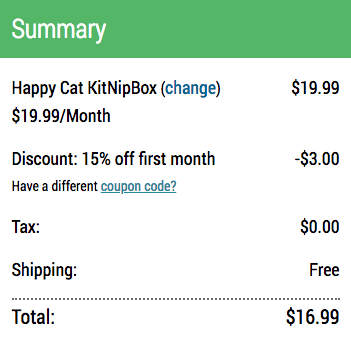 For February and March, they have a 15% off KitNipBox coupon code for your first month when you use the code “HAPPYCAT.” This coupon might last longer, so feel free to try it out if you’re reading past these months. There wasn’t an expiration date listed. It’s not a huge discount, but it’s better than nothing! I found numerous similarities and a few differences when I made a comparison between KitNipBox vs Meowbox. One similarity is the price! A typical Meowbox is made for one or more cats and costs $22.95 for 4–6 items. Like KitNipBox, Meowbox offers the option to remove treats and other edible products for kitties with sensitive stomachs. One difference between the two is that Meowbox offers monthly and bi-monthly boxes (shipments every other month). 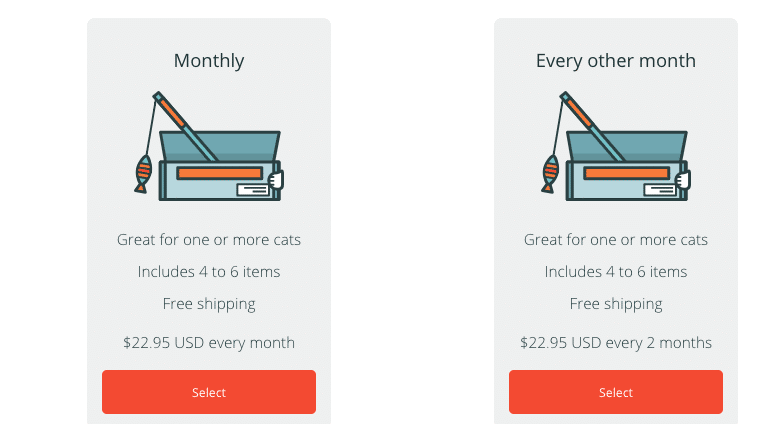 This is a good feature that KitNipBox doesn’t offer—not every kitty needs new toys every single month. They also have a shop where you can add extra items to your box. I’ll likely try this box out too, so keep your eyes peeled for my Meowbox vs KitNipBox reviews. On a final note, both of the companies actively support animal shelters and rescue efforts! 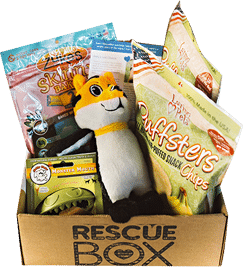 The final subscription box similar to KitNipBox is Rescue Box! This monthly box was created by an animal rescue website, so you know you’re supporting a good cause. For one, they’re part of a larger company that has donated over $40 million to charity. Their boxes help bring vaccines, food, and other benefits to animals in need. Make sure to check out a Rescue Box cat review rather than one for dogs since this company has options for both pets. Their boxes provide over $40 worth of hand-selected toys, treats, and accessories—all for $29.95 per month (or less, if you choose a longer subscription). I’m sure I will subscribe at some point, so stay tuned for a review of this box as well! Another popular cat subscription box is Whiskerbox! Although it’s a bit more expensive than KitNipBox, many claim that their products are of higher quality. The smaller box is $34.95 per month (4–5 premium toys and treats) and the larger box is $49.95 (4–6 premium apparel, toys, and treats). The box values are always higher than the price you pay. 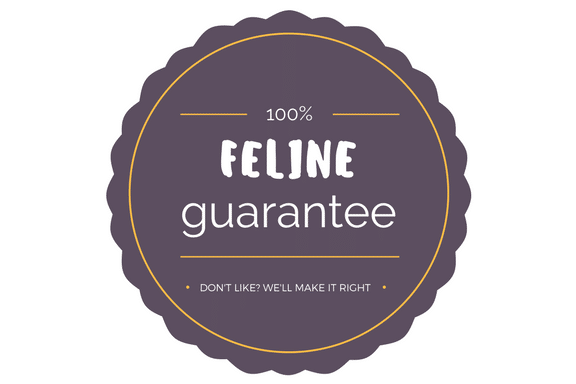 Plus, they have a 100% satisfaction guarantee in case your cat doesn’t like it. I just have one cat, so I chose the regular Happy Cat box for $19.99. I thought about getting the VIP KitNipBox, but I passed because these larger boxes aren’t even better in value. After placing my first order near the end of January, my box was shipped out next month in February. You can purchase an extra box that ships right away, but I wanted to wait. It shipped early February and arrived within a couple of days. Right when I opened the box, Benji became interested. I’d seen all kinds of KitNipBox Reddit pictures of cats inside the boxes, but I was still surprised by how enticed he was. He loves to climb inside boxes, but this particular box was much more interesting. He sat in it for hours! Each KitNipBox has a theme and this one was business-related items. This sounds like it would be boring, but it was adorable—I’ll show you why!